The Banjo Gathering (formerly the Banjo Collectors Gathering) is the only forum focused entirely on the banjo as a historical, cultural, and design object, in contrast to the many banjo camps, festivals and gatherings that are focused principally on playing the banjo. Since 1998, the Gathering has been the platform for sharing between banjo collectors, researchers, instrument builders, and musicians. The Gathering’s signature activities include formal presentations and a marketplace for attendees to inspect, buy, sell, and trade instruments and ephemera from the nineteenth and early twentieth centuries. The first Banjo Gathering occurred in Cape May, NJ in 1998 when 14 banjo collectors got together for round table discussions about minstrel-era banjos, classic era banjos, and banjo ephemera. Jim Bollman and Peter Szego put the event together at the suggestion of Bob Carlin. Although Szego thought it would be a one-time event, the success and excitement of that weekend prompted them to hold the second one the next year in Baltimore, Maryland, and they have continued the tradition since. For almost two decades this focus on the banjo as material culture continues to be compelling and engaging to musicians, collectors, scholars and instrument makers who value the banjo for a wide range of academic and non-academic reasons. Past Gatherings have served as the stage on which virtually all new scholarship on the roots of the banjo, cultural exchange, banjo makers and manufacturers and all other cultural, historic, racial and material aspects of the banjo has been first raised and presented. Participants explore the history of the instrument from its African origins to the center of the raucous Blackface Minstrel show to an instrument played by the turn-of-the-century New York upper classes to an icon of hillbilly music and America -- and all the implications of that history. Images from the Gathering and banjos you may see displayed. The 2018 Gathering will be the 20th Anniversary Gathering, and will take place in Bristol, Tennessee from Thursday, November 1 through Sunday, November 4, 2018. Find out more here. Peter Szego saw folk and bluegrass bands in the 1960s growing up outside New York City, and when he moved into the city in the 1970s, he was drawn to the rhythm and music of tap dancing. Rather than learn what was new and commercial, he tracked down some of the last black tap dancers in the city. When he moved to the suburbs in the 1980s, he started learning clawhammer banjo to get his rhythm fix. When he saw Jim Bollman's collection on display at the "Ring the Banjar" exhibit, it inspired him to start collecting. He is the editor of Inventing the American Guitar and co-curated the exhibit on Martin Guitars at the Metropolitan Museum of Art. See more of Peter's collection in Craig Evans's documentary on banjo historians. 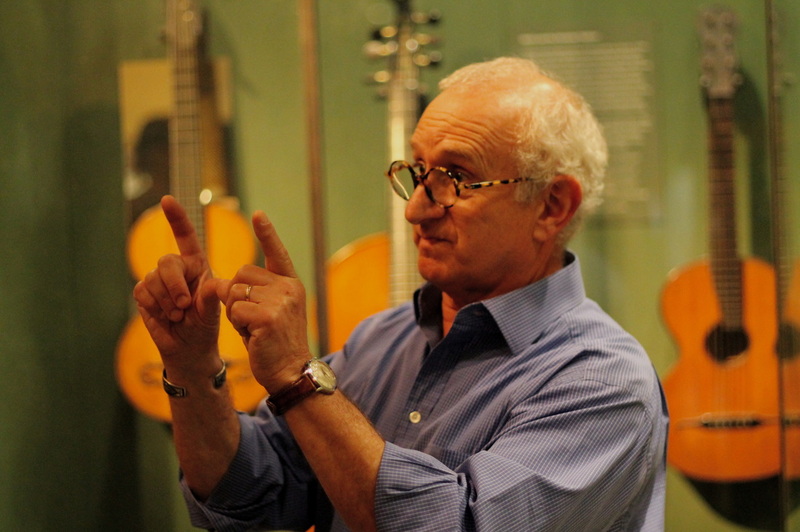 Peter Szego gives a tour of the exhibit on Martin Guitars he co-curated at the Metropolitan Museum of Art. 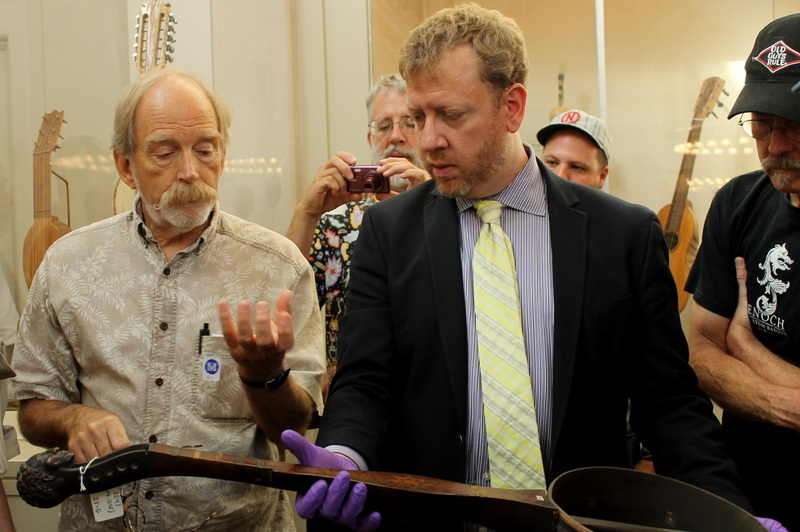 Jim Bollman, left, comments on an English banjo at the Metropolitan Museum of Art. Jim Bollman's first tune on the banjo was "Ain't She Sweet" - and it was actually on a banjo uke his mom had lying around. At 12, he traded his Dinky Toy collection for his first banjo, and has actively been collecting and playing the banjo since 1965 when he saw Mike Seeger play for the first time. He collects banjos and ephemera, and basically anything that can tell him more about the history of the instrument. Together with Phillip Gura, he is the author of America's Instrument. You can read an article about his collection in Forbes Magazine (2007) and he was interviewed for an article on the National Heritage Museum's banjo exhibit in 2002. We keep a blog of previous years' presentations and on-going research projects here.